When the Geminid meteor shower peaks on Dec. 13 and 14, a pesky, almost full moon is poised to steal fireball thunder. The annual Geminids are one of the most prolific night shows, with an average of 120 meteors an hour. As if losing ISON wasn’t bad enough; a bright winter moon is expected to reduce visible meteors 2 – 5 fold. Annual meteor showers result from earth’s orbit intersecting debris from a sun orbiting comet. Radiant point, is the name given to this intersection. Debris from comet 3200 Phaethon happens to intersect our orbit in the vicinity of constellation Gemini, hence – Geminids. To find Gemini, look for the star Castor, low on the east, north-east sky around 9 PM. Castor is one of the brightest stars in the sky and along with Pollux, make up the ” twin brothers ” of Gemini. The reason Geminids produce so many visible meteors is that the constellation and radiant point swing upward; by 2 AM the point is directly above you in the sky. The angle of the radiant, translates into no poor seats for this show – you can see it from anywhere, with 2 AM as your prime time. This year we have a waxing gibbous moon to deal with – not a deal breaker, but grounds for some new rules. Since the nearly full moon is so bright, you should wait until the moon sets. This year pre-dawn moon set offers the best view. Get out of town – away from city lights – and give yourself a few minutes to adjust to the darkness. Gibbous moon aside – I guarantee you’ll see fireballs – you don’t even have to find Gemini, the Geminids have a crazy way of appearing to come from any direction. To find out when the moon sets in your little corner of the world – a link…..
Ponder the last time you wished upon a falling star. 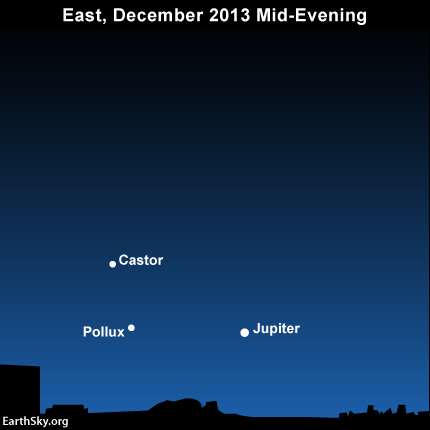 Jupiter, Castor and Pollux rise at early-to-mid evening in early December but at dusk or nightfall by the month’s end. The Orionid meteor shower peaks tomorrow night; while not one of the most prolific displays, with an average of 20 meteors an hour, it remains one of the easiest to locate in a pre dawn sky. Almost everyone has heard of the constellation Orion; distinguished by the distinctive three star “belt”. Find Orion and you’ve found the Orionids. Debris from the tail of Halley’s Comet lights up our skies from constellation Orion shortly before sunrise being the best time to catch a “falling star”. This year Orionids are forced to compete with a Hunter’s Moon -also known as a Full Harvest Moon. Luckily they are reliable when it comes to bright fireballs. So if your weather cooperates, haul yourself out of bed and marvel at our universe. I guarantee you’ll start your day with a smile on your face. Imagining a hot August night without Perseid fireballs strikes me as unthinkable. An asteroid is a solid chunk of space debris orbiting the sun; made of rock and metals it is considered inactive. Comets on the other hand can be quite active. Composed mainly of ice and smaller rocks, the “tail” we see is dust and gasses released from the ice by the sun’s energy. Meteoroids happen when asteroids collide; breaking into smaller pieces, or when the heat of the sun releases debris from a comet. A meteoroid that burns up in our atmosphere is called a meteor. If it makes impact; it becomes a meteorite. A meteorite the size of a beach ball would make a crater over 60 feet wide and almost 20 feet deep. The blast wave would flatten trees and kill any living thing within a mile of impact. Scientists consider anything under 100 LD (1 LD = distance from earth to the moon) a potentially hazardous asteroid (PHA). As of today there are 1366 PHA’s being monitored. On Feb. 15, 2013 DA14 – 57 metres, will pass between us and the moon at .9 LD. Behemoths like 3752 Camillo – 3.4 Km., and 1993 UC – 3.8 Km. will sail by on Feb. 12 and March 20 at 57.5 and 49 LD respectively. There’s no sense in losing sleep over space junk; we can’t really do anything about it. Though reading my post on cosmic paintball is an interesting theory to ponder. Instead; thank your lucky stars the next time you wish on a falling star that it was a meteor and not a meteorite. The weather outside is frightful, the Geminid shower is delightful. Peaking on Dec. 13 and 14, for those willing to bundle up in pre-dawn hours; expect up to 100 meteors an hour. Named the Geminid meteor shower as it appears to come from the direction of constellation Gemini. Geminid is believed to be debris from comet 3200 Phaethon, Phaethon broke apart after one too many close orbits to the sun melted its icy exterior. According to earthsky.org the best time to witness Geminid is between 1 and 3 AM on Dec. 14. Bundle up, drive far from city lights, and restore your soul. A bright Geminid meteor pierces the night sky over California’s Mojave Desert in 2009. Forget the “light of the silvery moon” bring on a glowing shower of fireballs. Between November 5 – 12 our planet passes through debris from Comet Encke, its known as the Taurid Meteor Shower. For those who trouble themselves with statistics, the Taurids may only average 8 meteors per hour. Not much of a show compared to the Perseids. Don’t despair; Taurid brings fireballs. One characteristic of Taurid is the space baggage it packs. Marble sized debris travels at a sluggish 27 km/second, allowing it to penetrate more of our atmosphere before burning up. Most cosmic debris enters our atmosphere at considerably higher speeds, fizzling out a lot faster. Taurid’s slow moving space junk may have be tiny when entering our atmosphere; many a good fireball comes in small packages.